Yelp is now available for Blackberry phones as well. Already Yelp has launched its application for iphone. 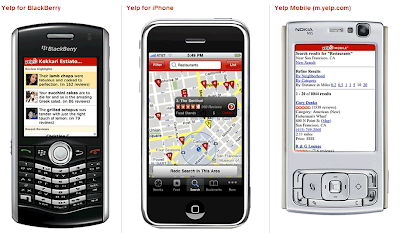 If you are using any other phone you can access yelp at m.yelp.com from your mobile. Yelp uses a technology to determine user's current location and then allows them to search for nearby restaurants, businesses , read reviews and also access map that enables you o easily zoom in/out from your current location and refine search based on geographic area. The start screen of the app lets you to browse, search for listings and also access to your recent searches. Yelp 1.0 for BlackBerry is read-only application as you cannot write and rate reviews, but its worthy app to installe in mobile. Yelp for Blackberry also works in the US, Canada, UK, Ireland and everywhere Yelp is available. Download Yelp for your phone now.